Cross-posted with Deep Sea News. How many marine species are there? It is a question that stumped even the Census of Marine Life (CoML), a 10-year long research project that involved thousands of researchers. Yet now a far smaller team of former CoML scientists has statistically estimated that there are about 2.2 million marine species, and a grand total of just under 9 million species on the entire planet. Census researchers tried statistical methods to estimate how many forms of marine life remain to be discovered. Alas, or perhaps wonderfully, the eventual number remains unknown. The upward curve of accumulation of new species for most taxa and regions has yet to bend enough to calculate a firm plateau. So after all the work of the CoML, how is it that five scientists from Dalhousie University and the University of Hawaii (and formerly of the CoML) have finally provided a statistical estimate? The trick lies in Linnaean taxonomy. The scientists reasoned that we have probably already found most higher taxonomic groupings (i.e. kingdoms, classes, orders, etc) as their rates of discovery are quite low. 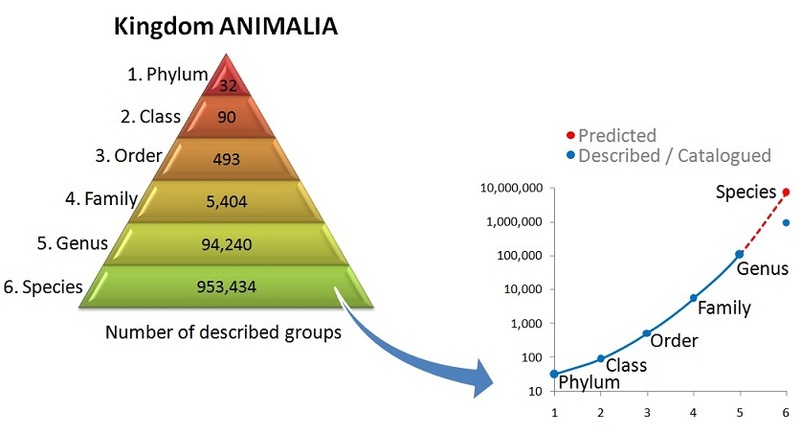 And since the number of groups found at each hierarchical level tends to rise as you move down the hierarchy, the researchers could estimate how many species might remain based on well-studied species groups. An analysis of the Catalogue of Life and the World Register of Marine Species ultimately revealed reliable numerical relationships between the more complete higher taxonomic levels and the species level. An example using the kingdom Animalia as a case study. The method plots data from higher taxonomic levels to predict the number of species. Credit: MoraLab. The CoML was a path-breaking endeavor that increased the number of known marine species from about 230,000 to nearly 250,000. Combined with this new study, we learn that there are about 2 million species left to discover. For those of us in the marine community, the ocean has long been a fascinating, mysterious, and exciting place, and I don’t think a jump in the numbers changes that. But it does provide us a measure of how far we really have to travel to understand our deep blue home, as well as how much we stand to lose if we cannot protect it. Note: These numbers refer to eukaryote species, organisms whose cells contain complex structures enclosed within membranes. The authors estimated the total number of prokaryote species, but expressed low-confidence as taxonomic discovery was still quite high. Microorganisms and viruses were not examined.